This Nativity is made by a group co-op of 400 Thai ethnic minorities spread out in several mountain villages in Chiang Mai province in Northern Thailand, near the Burma border. The pieces are all hand-formed in valuable nickel, brass, and copper metals. 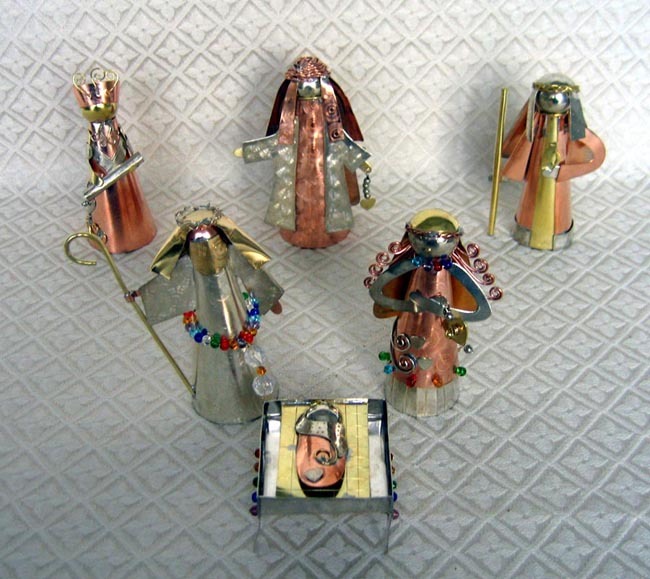 The set of six pieces includes the Holy Family plus three wise men with gifts. Some colored plastic beads further embellish the Holy Family figures. The standing figures are approximately 4 inches tall. The Thai group co-op owns all aspects of their business, which allows them to keep their families intact in this isolated area with sufficient employment. Profits are used for buildings and road infrastructure and to provide education for the youth.